Release announcements and important news from the developers. tjhrulz wrote: If you exit out of Rainmeter and reopen it (through exit not a system reboot) does it work then? (If US-English language pack is activated everything works, except 'Total VRAM Usage'). Stone wrote: No it's the same. Mind turning on debug logging (Under manage > settings and clicking the checkbox in about > log) and posting the results so that way I can see if it is a language issue? Last edited by tjhrulz on May 11th, 2018, 8:52 pm, edited 1 time in total. DBUG (20:50:19.438) UsageMonitorExamples\BasicExampleWin10\BasicExample.ini - [TotalVRAM]: Det blev forsøgt at læse eller skrive i en beskyttet hukommelse. Dette kan ofte være et tegn på, at en anden hukommelse er beskadiget. DBUG (20:50:20.441) UsageMonitorExamples\BasicExampleWin10\BasicExample.ini - [TotalVRAM]: Det blev forsøgt at læse eller skrive i en beskyttet hukommelse. Dette kan ofte være et tegn på, at en anden hukommelse er beskadiget. DBUG (20:50:21.486) UsageMonitorExamples\BasicExampleWin10\BasicExample.ini - [TotalVRAM]: Det blev forsøgt at læse eller skrive i en beskyttet hukommelse. Dette kan ofte være et tegn på, at en anden hukommelse er beskadiget. About the VRAM-measure: I can't make it work even if I use PerfMon, so maybe that's a problem occuring only on my computer? (a Rainmeter-restart as you suggest doesn't help either). Somehow you triggered a memory corruption error, that is a new one. 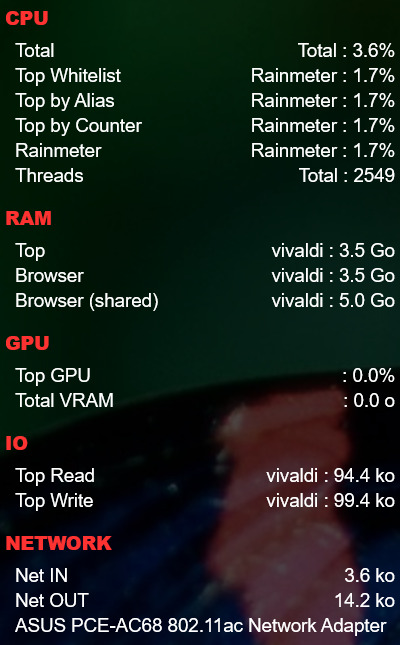 Also somehow your TotalVRAM usage is referencing the wrong counter and category. I think I have an idea though on the cause for this though. Simple test fail with setup in my signature. I rebuilt the performance counter on my OS before testing. No errors with my German version of Windows. OK the plugin works now - even in danish. tjhrulz wrote: To all of you with issues please try the just released Rainmeter 4.2 Beta Release - r3101. With any luck this should stop the one remaining crash and fix any language issues. Perfect using r3104 with french OS.